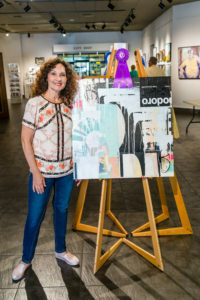 Over one hundred art works are currently on display at Mistlin Gallery, having been chosen from a field of over 250 entries by jurors on August 11. 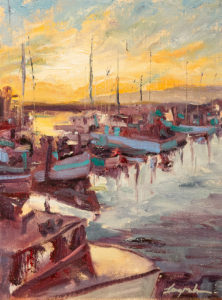 The Autumn Art Festival show runs through October 5. 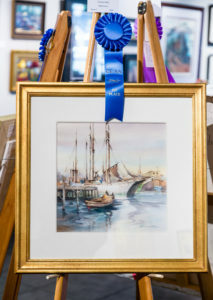 The following awards were given in five categories, plus judge’s picks and “people’s choice” from votes at 3rd Thursday Art Walk on August 16. 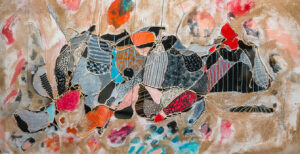 Best of Show by Nicole Slater, World on a String, mixed media. 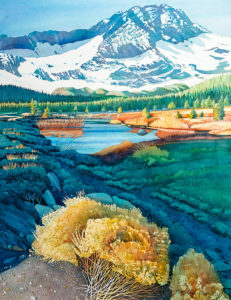 Hope Meadow, watercolor by Dan Petersen, 1st place water media. 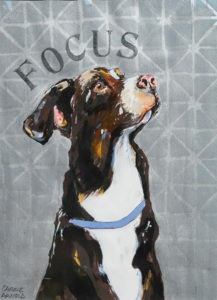 Focus, mixed media painting by Carrie Arnold, 1st place and judge’s choice by juror, Tina Moore. 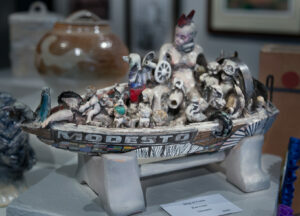 Ship of Fools, ceramic piece by Eva Hass, 1st place and judge’s choice by juror, Jacob Weigel. 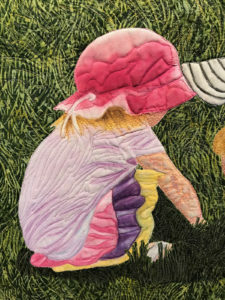 Closeup of a picture quilt. 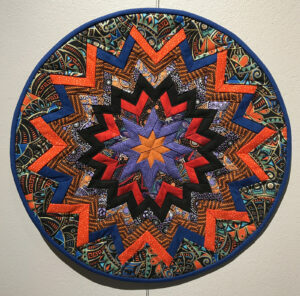 The quilters have made a special section with “mini” quilts, matted small creations selling for a the low price $40. Most of the larger quilts and works are for sale as well. If you’re interested in finding out more about Country Crossroads Quilters, their website is countrycrossroadsquilters.com or find them on Facebook. They welcome quilters of all experience levels, and encourage the growth of their skills. 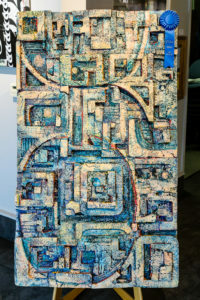 To aid this growth, the Guild has special speakers on a regular basis who bring the latest in quilting design and techniques to our members. 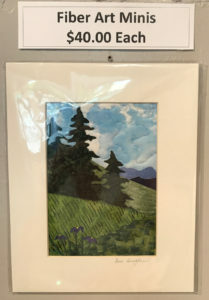 Members also share their techniques and skills, and there is an extensive lending library with several books in each of the most common techniques used in quilting. This special group of panels is also on display at the gallery. Blocks on the Move is an outreach program of the guild. 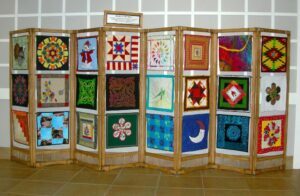 It is moved from place to place in order to bring the joy of quilts to everyone in our community. There are the kids who shout excitedly “I made brown!” after stirring their plate of primary color paints into an ooze of grayish muck. Or the kid in the hallway who runs up with a hug and says “Your’e the best art teacher” and I know I’m their only art teacher. Or the one who asks “are you a famous artist?” and I have to admit, no, not yet. Thank you to all the people who make it possible to do what we do…. Thank you to Julie Hawkins, who over the last 3 years has been SO generous with her time and enthusiasm for my ever expanding plans. She’s been an ear for new ideas, a helping hand and a shoulder to cry on. Thank you to my family. My dad has cut thousands of pieces of wire for classroom sculpture projects, and given up half the garage to store my art supplies. My sister, a kindergarten teacher, keeps me grounded. My daughter keeps me excited by looking at my photos of kids’ projects and hearing about my challenges with children and messy supplies. My mom, who passed away about 18 months ago, knew this was what I needed to do. Thank you to my team of teaching artists who put up with crazy schedules and sometimes crazier ideas, and love being with kids and sharing their art and their excitement for creativity. Through their patience and positivity, I see how we are affecting students. 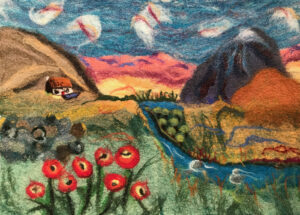 They send me pictures of students’ work, and tell stories about the kids in their classrooms. Like the student who just arrived from Syria with no English, but she can draw with the best of them. Or the autistic student who just wants to do the work all by himself, and when he’s allowed, does it wonderfully. 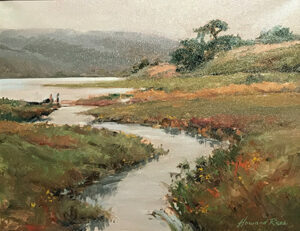 Thank you to the Central California Art Association for their moral and financial support. 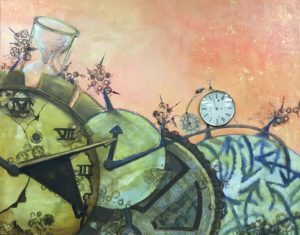 CCAA is a group of artists, supporters and friends who volunteer to run one of the finest art galleries in Modesto, the Mistlin Gallery. 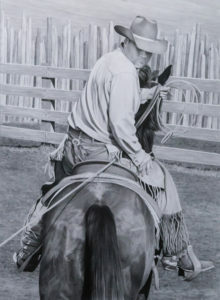 Members contribute time and talent to put on 10 shows per year and provide classes for all ages. 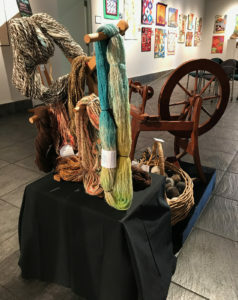 After the Stanislaus Arts Council’s “STARS” program stopped providing visual art classes, the folks at CCAA stepped in to create our CLASS program — Community Liaison for Art in Stanislaus Schools –- and asked if I’d like to take charge. So began the work of reaching out to schools to let them know about us. Four years ago, it was just myself and one other teacher, and now I coordinate 18 teaching artists. In just the past year, we have visited more than 30 schools in 7 school districts, touching the lives of more than 12,000 students. Thank you to the teachers who have made room for me and my team in their classrooms. Teachers work SOOO hard. And they deal with “that kid” for so many more hours than I do. Thanks to the administrators who support the idea of art education with their time and school budgets. 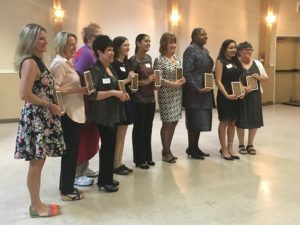 One principal, in particular, has secured thousands of dollars in outside contributions so that every child in her school has had this opportunity for the last 3 years. And an entire district administration that has committed to bring our art classes to every Kindergarten through 6th grade student with district funds. These people believe art really does make a difference to children. Thank you to the parents whose children we serve. Who sometimes have to wash the paint or clay out of their clothes. I overheard a frustrated parent in the hall one day, saying “the only time my kid wants to come is school is on art day.” My heart swelled. Even though I really believe kids should be excited to come to school EVERY day. 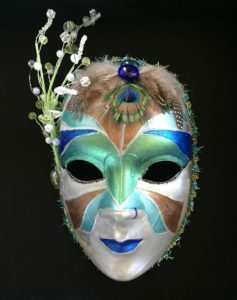 Visual art is a window to the world. It gives voice to the students who are often unheard. 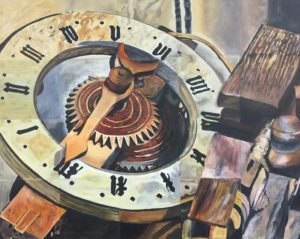 Put a paintbrush in the hand of a child who doesn’t have even a pencil or crayons at home, and you’ll quickly see why art is called the universal language. SO, in the long term, I’d like our program to keep expanding. We’d like to share hands-on experiences with more students… especially those who don’t typically have access to arts. Children need to participate, not just watch. To make this happen, we depend on the generosity of the community, schools and families who help CCAA keep its doors open. We all need to speak up and say, YES, the arts are important. While there are many challenges in the world, I’m still grateful for the people, places and things I have. I’ve been an active member here at CCAA for about 5 years now. I’ve become friends with this group of hard working volunteers, the folks that run the gallery day in and day out, who are very dedicated and caring people. New members and old are welcome to exhibit their work, take part in our activities and be part of our art community. I’m grateful for all of our members’ participation and contributions. I’m also thankful for all of our patrons, students and friends who continue to support us. 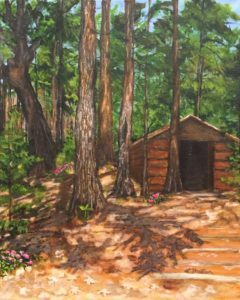 Our gallery is a place that the community can be proud of. 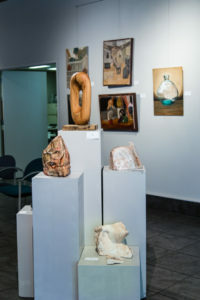 CCAA’s exhibitions, whether members, students or community groups, remain free and open to the public. Our education center offers high quality classes for children and adults. 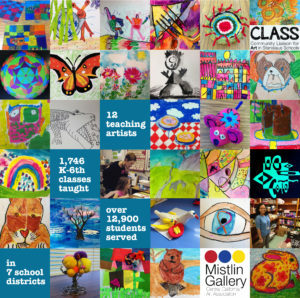 Our teaching artist program, CLASS, is reaching thousands of children throughout the county. I’m thankful for the opportunity to work with schools and meet all the dedicated administrators, teachers, and families who support the idea that art is an important part of a child’s education. I’m also thankful to lead this dedicated group of teaching artists who bring creativity and enrichment to my life as well as their students. 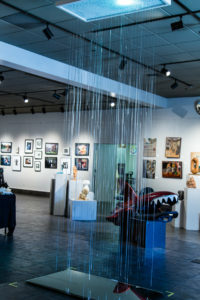 If you’re thinking of making a year-end contribution to a local non-profit organization, please consider giving to Central California Art Assocation. 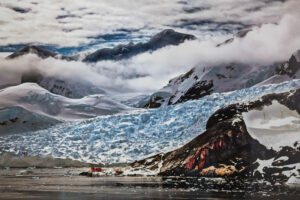 Your tax deductible contributions directly support our gallery operations and education programs. You can donate through PayPal by clicking the Donate button below, or mail your contribution to CCAA, 1015 J Street, Modesto, CA 95354. In order to improve our communications, we’ve decided to redesign our website. Our goal is to make the menus and information more user friendly by being concise and easy to navigate. 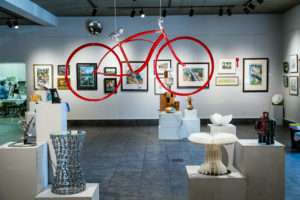 You’ll find information about the Mistlin Gallery’s exhibitions, education programs, as well as membership and other timely information. Ultimately, we’ll be adding links to member artists’ websites, and forms that you’ll need to participate fully in the gallery’s activities. If you have any suggestions, please feel free to contact us.